I had the pleasure of having lifestyle and travel blogger, Aurelia Paquette, visit my shop a couple of weeks ago. The Golden Age is an engaging blog full of beautiful photos by Aurelia coupled with her stories and experiences. It was a pleasure meeting Aurelia and introducing her to the gallery and the artists, whose work I surround myself with each and every day. Check out Aurelia's gorgeous blog at thegoldenageblog.com and follow her on Instagram too. Be on the lookout for her next blog about visiting the Pioneer Valley including dmg! Below is a photo by Aurelia of our gift box ~ love it! Yikes, has it really been two months since my last blog? Well, here I am with wonderful news! 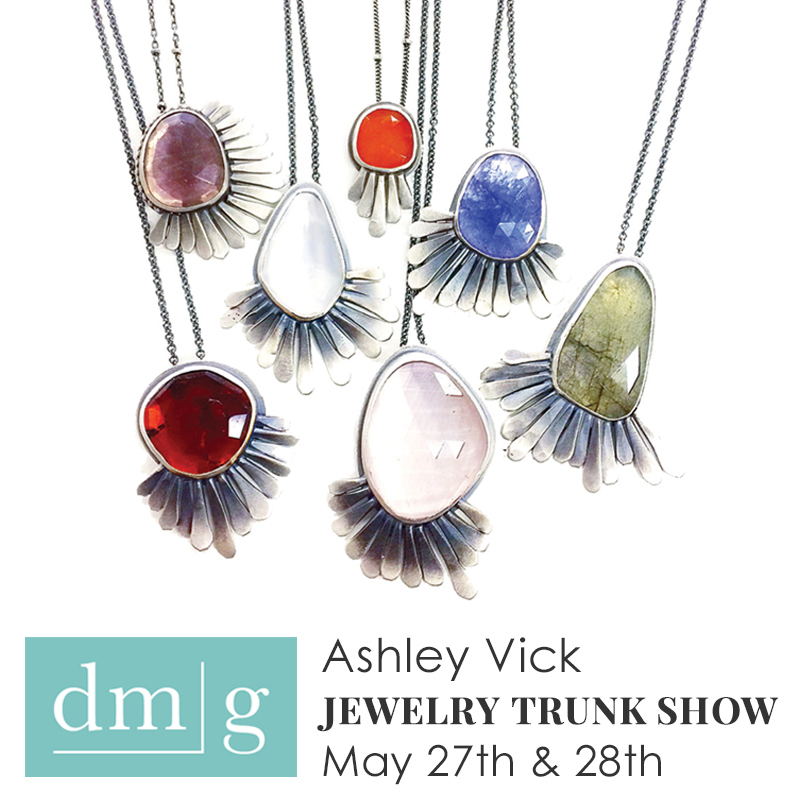 This weekend, we have our trunk show with artist Ashley Vick of Filomena Demarco Jewelry! Our 7th annual Bridal Jewelry Show is this weekend! This year, we have three designers at the event ~ Sholdt Design, Chris Ploof Designs, and Ananda Khalsa. 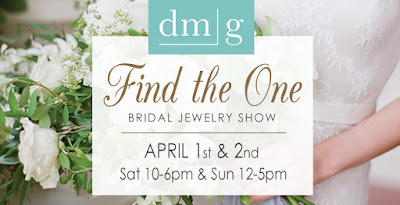 The featured designers will be here on both Sat and Sun with their extended collections including engagement rings, wedding bands, and other fine jewelry such as earrings, necklaces, and bracelets. Save 15% off your ring purchase by the three artists during the event! We are teaming up with some amazing local wedding vendors too. During the event, you can learn more about these vendors such as Tanya Costigan Events, Forget Me Not, Dani Fine Photography, and Salon Herdis, enter to win great giveaways and sample delicious cupcakes by Sassy Mama's Delectable Cupcakes. It's an all encompassing bridal event that you will not want to miss! I recently had the pleasure of connecting with Prosperity Candle right here in the Pioneer Valley. I had a fun visit to the studio and met Patsy and a couple of the women who make the candles. Not only are the candles absolutely divine, every candle sold helps support a living wage for the women refugees that create them. Great product for a great cause; it's a win win! The Pioneer Valley tobacco barn candle (created in ode to Western Mass where I live) and the Burmese candles are now available in store and online. We have the Pioneer Valley candle burning throughout the day and the gallery smells AMAZING! Tobacco barn, you say? Yes, that's right. The scent is a blend of tobacco leaves and aged cedarwood with hints of amber and leather and a touch of musk, spice, and pimento berry essential oils. It's the best smelling candle and it's a must have for yourself and all of your friends and family! Just got back from my first buying trip of the year! I took the train from Northampton to NYC for the NY NOW gift show. It proved to be a successful trip with great reorders from a few of my favorites including Laura Zindel, Vanessa Gade, and Terrafirma Ceramics, as well as the discovery of new artists. After a hiatus, Satomi Studio is back at dmg with her new collection of jewelry. Newbies to the gallery this spring include jeweler Alana Douvros and MA-based textile artist Sweetgum Textiles. Textiles, you say? Yes, I am branching out this year and will be carrying some throw pillows! So excited! I'm looking forward to bringing you lots of irresistible merchandise in 2017, as well as great special events. Keep in touch on Instagram and Facebook. Happy New Year! Still recovering from the holiday season, but I'm slowly getting back in the swing of things. Kids are back to school, extended family visits are over, and our Christmas tree and decorations have been put away for another year. I'm excited for 2017 with plans of great new inventory and special events you will not want to miss! Just booked my buying trips to New York, Philly, and Baltimore in Feb and I'm ready to go, go, go! Thank you for your continued support and I look forward to serving you in 2017! Need I say more? 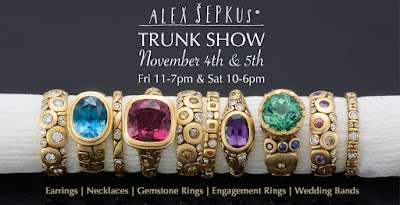 We're thrilled to be having our Alex Sepkus Trunk Show this weekend! The show will be on Fri (11-7pm) and Sat (10-6pm). 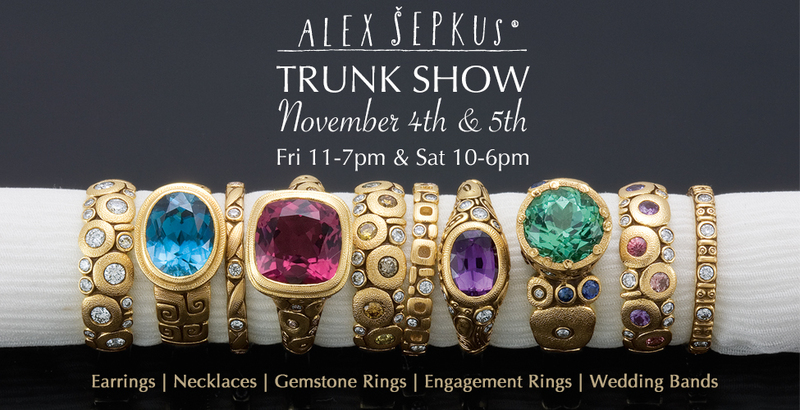 For two days only, you can see the extended collection of this award-winning jeweler including rings, earrings, pendants and and bridal. Hope to see you there!